The first of Corby’s zero energy bill homes has been sold and interest in the project is growing. The properties are being built at Priors Hall Park in a scheme by Electric Corby. 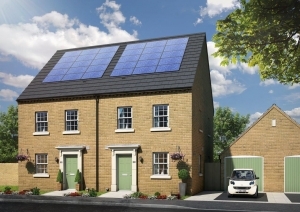 Due for completion this spring, the three bedroom semi-detached properties have the latest technology for generating and conserving electricity and heat, saving the homeowner an average of a £1,000 a year in energy bills. With the addition of a home automation, families will be able to remotely control and manage their home’s lighting, appliances, heating and hot water from a smartphone, tablet or computer. Andrew Simpson, of Simpson & Partners, said: “Priors Hall Park is bringing together the qualities of the traditional English village, with modernity that delivers sustainability and brand new amenity. Work started on the eight homes in November last year.